Mish Slade: May I Have Your Attention, Please? In her book, May I Have Your Attention Please?, Mish Slade grabs our attention with a guide to better business writing that charms, captivates and converts. Her company helps small businesses develop content that really sets them apart from the competition. 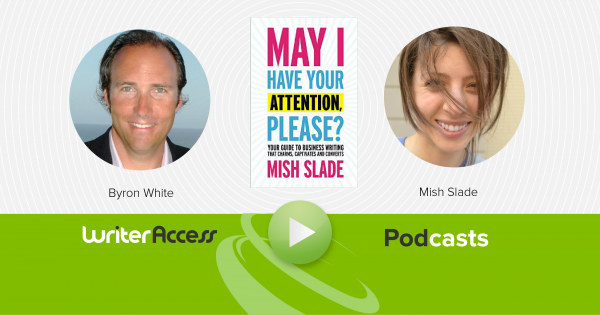 Mish shares some of her tips and discoveries in her quest for excellent copywriting on this week’s Writer Podcast, with Byron White, CEO of WriterAccess. Why companies want better writing, but often fail to achieve it. How writers can connect with clients and bring the brand personality into the content. Why companies need good writers to get good copywriting. How companies can find their niche and find a focal point in their target market. How great content can lead to better conversions and higher sales. Mish realizes that most companies struggle to find content related to but not simply focused on the products they offer. She stresses the importance of writing from a unique perspective and really capturing why you do something, rather than how you do it or what you do. Rather than trying to market to an entire industry, Mish really believes that finding a niche is key to connecting with a focused target audience that really identifies with what you have to say. Businesses have to then align their corporate writing to clarify their company personality, meet their target audience and express their company purpose. When these three points are effectively included within concise copy, businesses are able to retain visitor attention. But, too often, companies believe they are qualified to write their own copy. Mish points out that many aspects of company marketing, such as graphic design, web design or photography, prove to be difficult for company leaders, so they trust an expert to handle their work. On the other hand, many people can write at some level, so they mistakenly believe they are capable of content writing. Content writing, says Mish, is an entirely different animal than other forms of writing. She says there is a misconception that well-read writers make good writers, but she says it takes a lot of writing, editing and practicing to turn a writer into a good writer.